Velomobiles – Ethan Davis‘ site devoted to enclosed HPVs. Malcolm Steck’s Homebuilts – several innovative designs (including ’single-track trikes‘). Power Pumper – a molded fixed seat quad for kids (‚adult model soon‘). 2001 Ice HPV „Championship“ – annual fun event in Minnesota. Ice-scull (drawing) – rendition of Iain M. Banks‘ fictional HPV. Trampofoil, (2) – a HPB without the ‚B‘. Dolphin Man – (see ‚Miscellaneous‘). Trikke – a novel ’skating‘ trike from California. Semcycle „giraffes“ – unicycles with 2 and 3 stacked wheels. Uniracer (drawing) (see #2 âï¿½“ 2nd pic) – a streamlined version of the Monocycle. John Foss‘ Garage many unusual unicycles – including 1ÂÂ½ and 13 wheelers. Killer Tomato – Bob Durst’s two wheel ‚trike‘ kinetic sculpture. The Redundant (picture) – George Reynolds‘ 26/26 convertible bike. 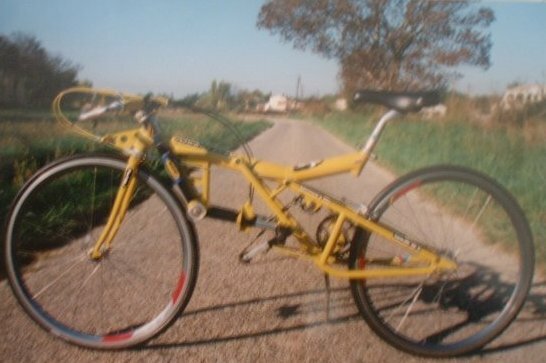 Rotobike – an Italian ’no-hands‘ bike. Homebuilt FWD Recumbent – Barnett Williams‘ fully suspended, FWD, short wheelbase bent. Recumbent History – Peter Stull’s interesting ‚The Bicycle Man‘ site. Chameleon – Bill Stites‘ FWD leaning urban trike. Organic Engines‘ S.U.V. 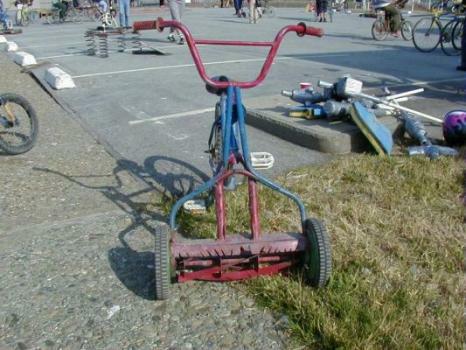 an impressive lean steered delta utility trike. Crank-it – a fully suspended ‚Mountain Quad‘. Wishbone“>ftp://ihpva.org/incoming/wbone2.jpg“>Wishbone (picture) … a SWB lowracer. Canoe-carrying Suitcase Trike Richard Guy Briggs‘ modified tandem Greenspeed Trike. ViewPoint Waltz … a partially recumbent ‚back-to-back‘ triplet. Snek – Derk Thijs‘ simple cable transmission for row bikes. Power Curve – vari-speed ‚Liquid Drive‘ system.